Miss World contestant (Miss Jamaica) Alison Barnett signing an autograph outside her old school 1985. Headteacher Mr Leslie milne, and teacher Mrs Gladys Cruickshank can be seen at rear right and left respectively. Have I got it wrong but I remember Miss Jamica as Catrina Campbell whose 2 brothers, Alan and Callum went to Alford school and stayed with us in winter as they lived in Corgarff. If there were 2 Miss Jamica's at Tullynessle, I apologise. Really enjoy the old photos. 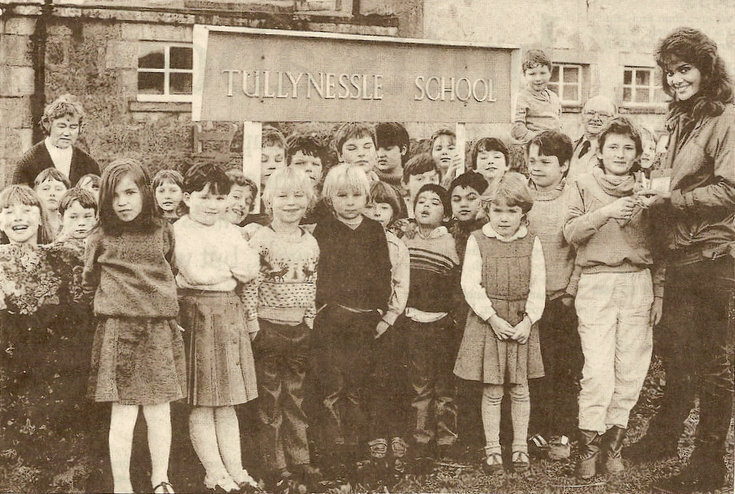 The Barnetts lived at the old schoolhouse Tullynessle at one time anyway. Alison had a brother Alan I remember him from my days in the Alford scouts. Could be the same person, probably her married name was Barnett. Her husband was a teacher at the school for a short time but went home to Jamica when Catroni sadly died very young. Alison's dad, Coledridge, was an English teacher at Alford. I believe you had to be unmarried to enter miss world. Thought a lot about this one and think I have to give you an apology Al, Catrina went away in the 60's and the photo is 80's so it has to be her daughter. Coleridge Barnett came from Kingston, Jamaica, and married Catrion Campbell when she went there with VSO. He was a close friend when we were students together in London from 1964-67. He went back to West Indies, and Catrion contracted cancer. She wanted to spend her last days back in Scotland, and so they went to Tullynessle, where she died. Alison was their daughter, who was six when Catriona died, and a pupil in the school, where her dad taught. She became Miss Jamaica in 1985, and came as 4th runner-up in the Miss World contest that year. Yes..Coleridge was H.M. of Wesley College and lived at Yarborough Manse with Catriona, and Alan and Alison. This was my first teaching job (VSO), 1966; Great to get an update after all these years. I subsequently worked in Turks Is, and taught in The Bahamas. Remember you all with affection. I did my teaching practice with Catrionas mum Jean Campbell.Catriona,Calum and Allan and their parents were friends of our family my parents were Bruce and Jo Watson.I have a portrait of me done by Catriona while she was at Art School.She was a lovely person.